Police are hunting three men after a woman was gang raped in Doncaster town centre. 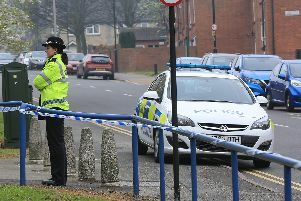 The 21-year-old was attacked in an alleyway off Beckett Road, between Old School Way and Strafford Road, overnight on Saturday into Sunday last weekend. Three eastern European men are being hunted by detectives and extra police patrols are being carried out. Detective Sergeant Peter Swift, leading the police probe, said: “There is a large amount of residential properties in the area and at around the time the incident took place there may have been a number of people returning home from a night out- did you see any groups of men that looked out of place? “If any of the information in our appeal fits with anything you may have seen, please contact us. “I understand that local people will be concerned and I would like to reassure them that we are treating this investigation as a priority with all the resources people would expect. Anyone with information should call South Yorkshire Police on 101 quoting incident number 335 of October 5. Crimestoppers can also be contacted on 0800 555111.